Hot Tub Benefits | Why Buy a PDC Spa & Hot Tub? Just 15 minutes in a hot tub relaxes muscles, calms the mind and increases body temperature allowing you to fall asleep easier and stay asleep longer. Wake refreshed and ready for the day. 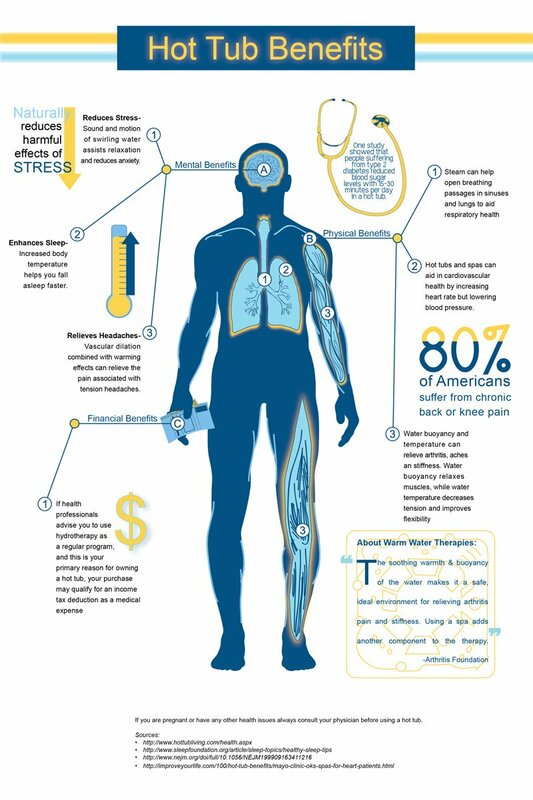 Warm water therapy is a highly recommended natural strategy to relieve chronic pain. Water’s natural buoyancy reduces body weight by 80-90%, relieving pressure and reducing pain symptoms. Improved circulation and lowered blood pressure assist in healing. The Arthritis Foundation recommends warm water immersion to decrease swelling, inflammation and pain from conditions such as arthritis, fibromyalgia, rheumatoid arthritis, carpal tunnel and many more. 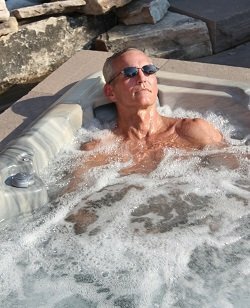 Water’s natural buoyancy relieves pressure and allows a greater range of motion to help improve mobility and flexibility, in and out of the hot tub. Stress, tight muscles in the back and neck, lack of sleep; many things can trigger a tension headache or migraine. Routinely relaxing in a hot tub can alleviate symptoms and decrease the frequency of these occurrences. Inhaling steam is proven to reduce inflammation and discomfort associated with sinusitis, allergies, colds and other respiratory conditions. Moisten nasal passages, relieve sinus pressure, congestion, throat irritation, and improve breathing with a relaxing soak. Hydrotherapy has long been prescribed by medical professionals to aid in the treatment of injury. With less discomfort, warm water immersion helps to accelerate the healing process offering a broader range of motion, increased blood circulation, improved flexibility and the ability to preserve strength. A warm water massage alleviates muscle tension and reduces stress from head to toe. Taking time to relax in a hot tub is a daily ritual that not only feels good, but is good for you resulting in better sleep, less fatigue and an overall improved feeling of wellness. A independent study published in the New England Journal of Medicine found soaking in a hot tub to be beneficial for people who live with Type 2 Diabetes. Participants experienced lower blood sugar levels and improved sleep patterns after using a hot tub throughout the study. Whether your primary hot tub use is for relaxation, massage therapy, ailment or entertainment, everyone will enjoy coming together for quality time in a hot tub. Set the cell phones and screens down to interact with loved ones and experience a much needed break from hectic work, school and personal schedules. Upgrade your home’s outdoor space to one you can enjoy year round. Just footsteps away, a hot tub provides health, wellness and family fun in any season, all in the privacy of your home or backyard. Outdoor areas for relaxation and entertainment are a great way to improve your living space and potentially increase the value of your home. Relaxing outside in a hot tub releases our body's natural “feel good” hormones, reducing anxiety and improving our mood. The effects of just 15 minutes of warm water immersion and enjoying nature, results in better concentration, more creativity and better sleep. Aquatic Fitness Strengthens, Tones and Heals. Learn more.